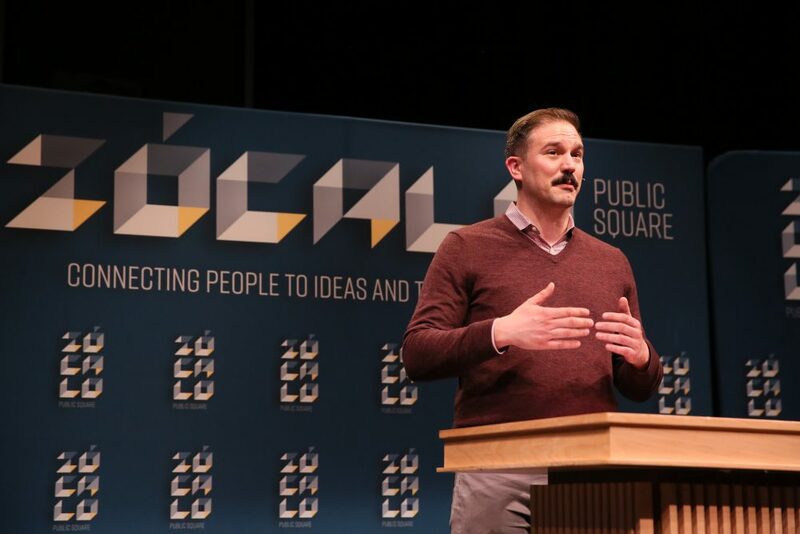 The Eighth Annual Zócalo Book Prize Award Ceremony began in Tucson, Arizona, traveled from Los Angeles to Pretoria, South Africa, and Rio de Janeiro, Brazil, and made stops in Hungary and Canada in a globe-trotting exploration of place, community, and the forces that connect us to one another. The ceremony, which took place at the National Center for the Preservation of Democracy in downtown Los Angeles, began with Charles Jensen, winner of this year’s Zócalo Poetry Prize for the poem that best evokes a connection to place, reading his poem “Tucson,” about his former home in Arizona. 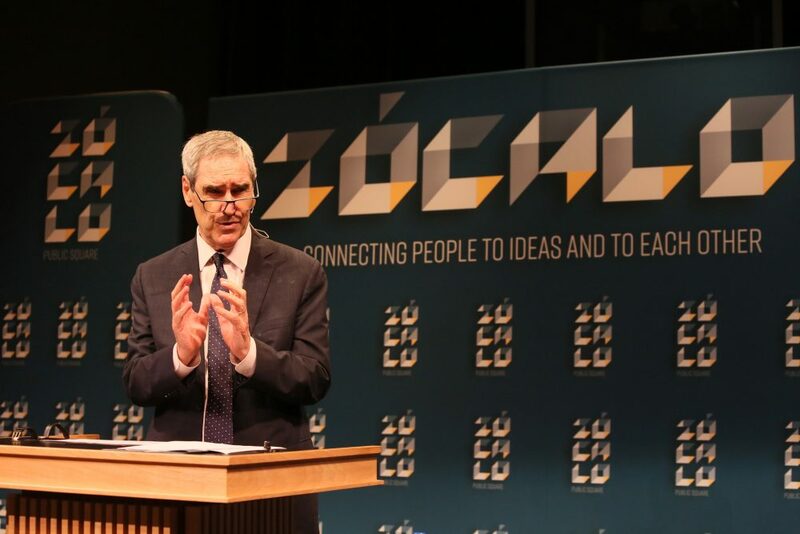 Then, Zócalo Founder, Editor-in-Chief, and Publisher Gregory Rodriguez presented the 2018 Zócalo Book Prize to Central European University rector and president Michael Ignatieff for his book The Ordinary Virtues: Moral Order in a Divided World. The Ordinary Virtues, explained Rodriguez, is the nonfiction book published last year that best enhances our understanding of community. Ignatieff is the eighth winner of the prize and joins a coterie of writers and thinkers that includes Sherry Turkle, Danielle Allen, Jonathan Haidt, and Richard Sennett. 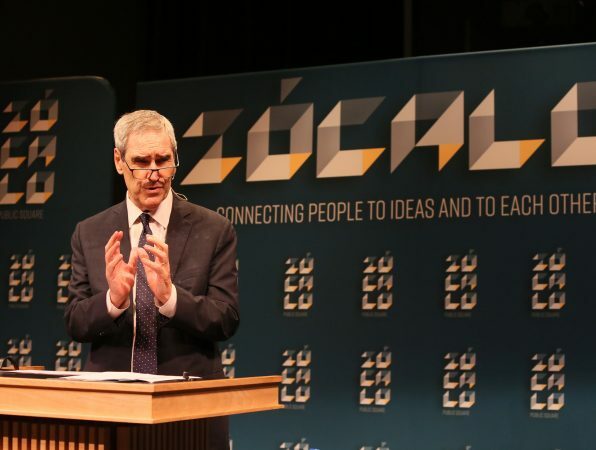 As Ignatieff opened the Eighth Annual Zócalo Book Prize Lecture, “Are Ordinary Virtues More Powerful than Universal Values?”, he said he was nervous to be facing an audience of Angelenos, given that a chapter of The Ordinary Virtues is all about Los Angeles. “Everyone here knows more about L.A. than I do, which is a very foolish position to be in,” he said. 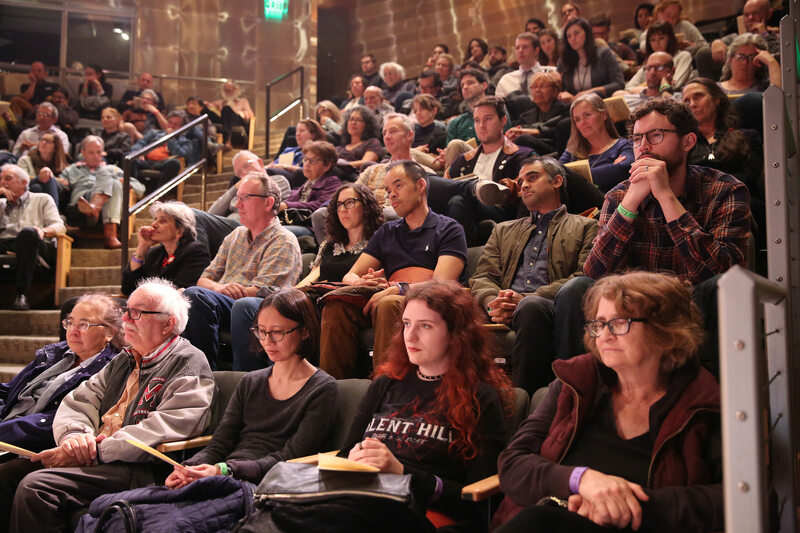 Writing The Ordinary Virtues took Ignatieff to cities around the world to study what he calls their “moral operating systems” that allow communities made up of diverse races, creeds, and classes to live together. These operating systems, he found, are based on “ordinary virtues” like trust, forbearance, and a “live and let live” attitude. “But we don’t celebrate the ordinary virtues enough,” he said. What we do celebrate, and rightly so, Ignatieff said, are more abstract principles such as human rights and equality, which have been revolutionized since the end of World War II. The idea that “all individuals are equal,” Ignatieff said, “has been convulsively important in shaping our moral imagination since 1945.” Today, “when anybody speaks,” regardless of their economic or educational status or the color of their skin, “we are bound to listen and hear.” It’s a tremendous shift from the first half of the 20th century, the Canadian author said, when white people, including himself, believed that they were born to rule. By contrast, an “ordinary virtues” perspective toward migration sees refugees as “strangers at the gate,” and it is up to the citizens within the community to decide whether to let them in. The citizens are not obligated to take migrants in but can give them the “gift” of letting them in. This, said Ignatieff, the former leader of the Liberal Party of Canada, is what sustains generous refugee policies in his home country. What can we do about it? 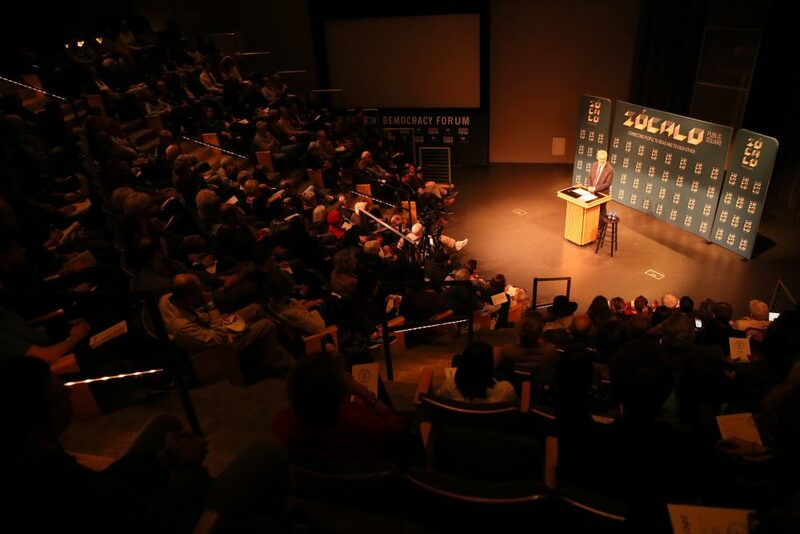 “We need to strengthen both ordinary virtues and universal values,” said Ignatieff. “The issue is how we balance the preference we ought to accord to citizens with the obligations we ought to have to strangers.” He admitted that he has “no magic answers,” but he found in his travels that a few things held true in strong communities. 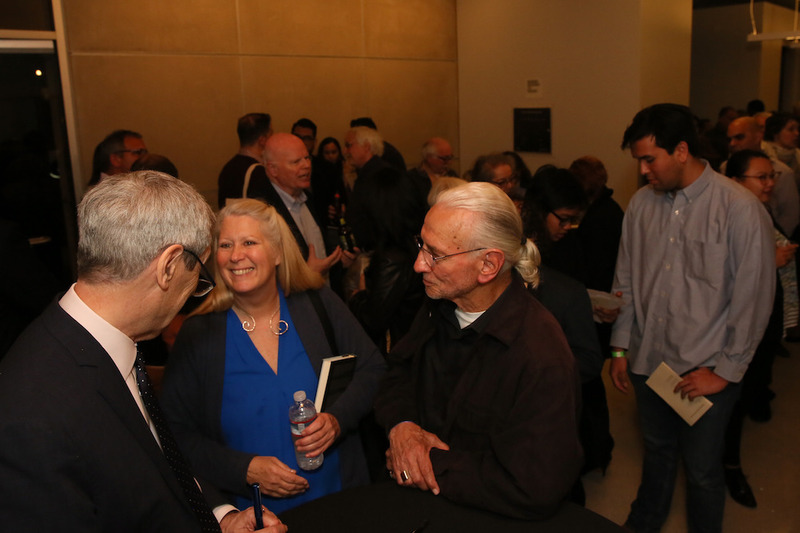 He noted that he found community in Los Angeles at places like churches, mosques, and synagogues sustained by good leaders and people’s desire to connect. “Building from the bottom made me feel optimistic,” he said. You also need to have democracy at the national level, he said. America is “the country that married nationalism and internationalism” under both Franklin D. Roosevelt and Ronald Reagan, said Ignatieff. “This is not a partisan political plea.” Rather, it is a fundamental truth this nation must return to. “The genius of America combines a deep commitment to others with universal values,” he concluded. The audience question-and-answer session pushed Ignatieff to talk more about solutions to our current political and cultural impasses. Another audience member asked, “Do you think the universal values are our final goal?” And if so, are ordinary virtues simply a bridge to get to universality that we can later abandon? 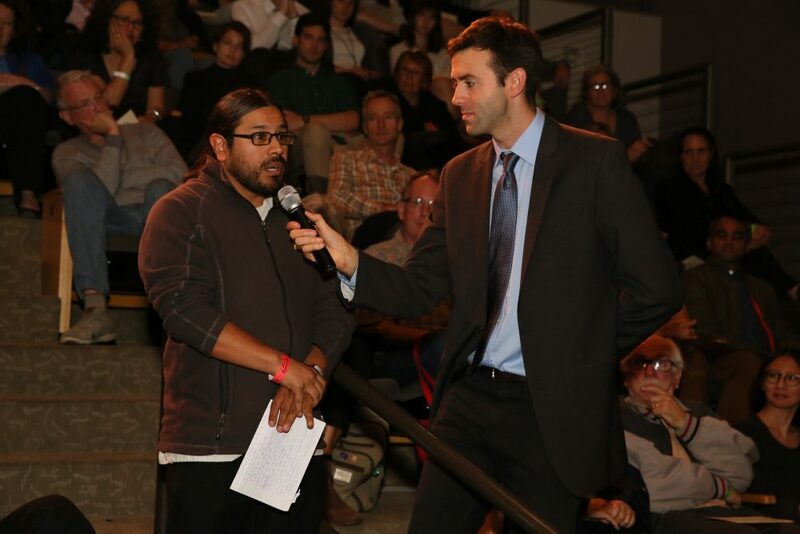 Perhaps, suggested another audience member, human rights is just too abstract for us to understand. Human rights don’t play a role in most people’s moral decision making, Ignatieff replied—and he has spent many years teaching human rights. “No one reasons like Immanuel Kant when they’re in a tight place,” he said. Human rights “makes a presumption about human rights I don’t think is sociologically true. You’re always dealing with the person in front of you.” That person belongs to a certain gender, a certain race, comes from a particular place. We find the common ground of our shared humanity much later in the story. Sarah Rothbard is Book Prize Editor at Zócalo Public Square. Charles Jensen, winner of the 2018 Zócalo Poetry Prize. 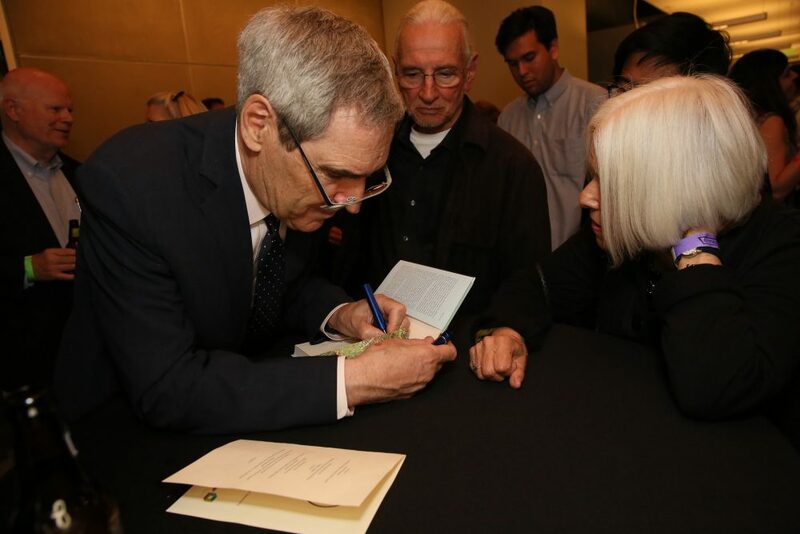 Michael Ignatieff, author of The Ordinary Virtues: Moral Order in a Divided World, speaks with guests at the reception.